Between work, spending time with the kids and keeping the house in shape, I’m lucky to get more than 30 minutes of cardio in at the gym on a given day. So to make sure I’m using those precious minutes the most effectively, I use a heart rate monitor. It’s a great way to make sure I’m challenging myself without pushing past my limits. Many heart rate monitors use a chest strap, like my go-to device the Adidas miCoach Pacer, a three-part system with a pedometer, heart-rate monitor and audible coaching device. I don’t even feel the chest strap when I work out, but some people can’t stand the way it feels. So recently, I checked out the Scosche myTrek ($129.95 on Amazon.com), a monitor that straps to your forearm and provides feedback through an iPhone app. Setting up the myTrek is easy. Pair the myTrek to your iPhone, download the free myTrek app (your phone guides you through after successfully pairing) and you’re ready to go. To start working out, you’ll first want to establish your heart rate zones by entering your age, gender, weight and resting heart rate. If you’re more physically fit than average, you’ll need to lie about your age. Then you create a workout. Select the type of activity (running, cycling, yoga, walking, aerobics), your target training zone (resting, weight loss, fitness, performance or red line) and type of workout (free, distance-based, time-based or calorie-based). Press the Start Workout button and MyTrek will start recording your workout. While you’re working out, you can listen to music from your iTunes library. 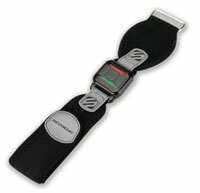 And using easily accessible buttons on the armband, you can even pause play, adjust volume and skip tracks. If you’re not in your target heart rate zone, you’ll hear prompts to work harder or to slow down in between songs. 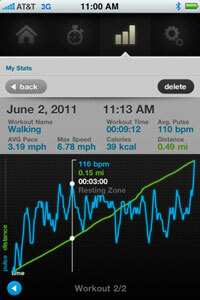 You’ll also get updates as you progress through your workout, based on distance, time or calories. And you can always check your progress onscreen. 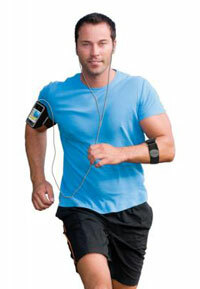 The armband heart-rate monitor is comfortable and comes with three strap sizes to accommodate a range of forearm sizes. It maintained its snug fit throughout my workouts—even when I lifted weights. When you’re done, you can view a chart showing your heart rate and check your stats: average pulse, distance, calories burned, page, average speed and workout time. All the workouts are saved to a calendar, so you can go back to check earlier workouts. I would have liked the ability to map my route and sync my workouts to an online service, like you can with iMapMyFitness, Adidas miCoach and Nike+ GPS apps, among others. But if you just need a heart-rate monitor and basic tracking application, the Scosche myTrek delivers.